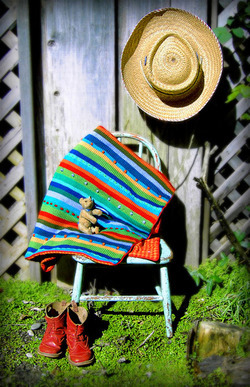 The Wild Stripes baby blanket from the most recent Knitty. 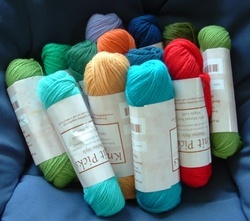 I was feeling completely color challenged when ordering, and really like the colors it was designed in, so I ordered exactly that yarn. 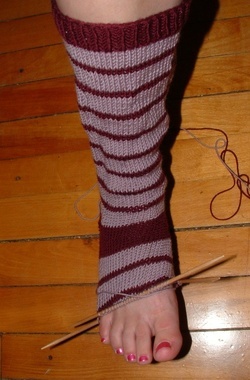 Besides, I've been wanting an excuse to try out Knitpicks and see if my yarn snobbish doubts about it are true. The yarn arrived today and I've already cast on! I've only got a few weeks left to get this baby blanket done....can I do it? It is sportweight, with fabric backing. Oy. Guess I'll be putting those socks down for a bit.